This back to school ice breaker game will get your students up and moving on the first day of school. Students will mingle with classmates, ask questions, and get their new friends to sign off on their paper. Students try to finish by getting each classmate to sign only one box. That way students are encouraged to talk to as many classmates as possible. 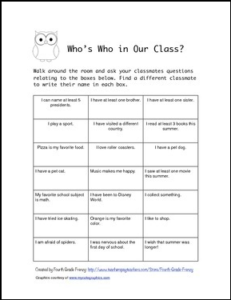 Once the class is finished, begin sharing some information about each student. You might want to begin the discussion with a question like, “Who can tell me something about Brianna?” Continue until all students have been named. The students love it when their teacher joins the game!